I thought I'd share how I made it, in case you want to make one too! First, I bought a pack of cotton flannel receiving blankets. Why the pre-made blanket? Because the edges are already finished off. If you buy your own fabric, that's great, but then you'll want to sew the edges to prevent them from fraying. Again, no sewing for me, so I bought the blankets! I bought sports themed blankets for my friend, the mom-to-be, who is sports fanatic. Next, I needed a way to get the holes into the fabric so I could crochet the edging. 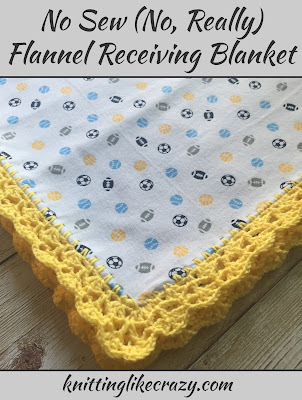 Fortunately, I had met someone at Stitches Midwest who was making one of these blankets and she introduced me to the wonders of the wide-skip rotary blade. I had the 45mm rotary cutter so all I had to do was order the blade. You need the wide-skip blade so that the holes aren't too close together. This worked perfectly! After that, it was time to make the holes. Using my rotary cutter, a yard stick and my cutting mat, I "rolled" my holes 5/8" from the edge. The hole-making was done in no time! Then it's on to the best part - crocheting! The yarn I chose was a sport weight, acrylic baby yarn from the craft store. Due to the spacing of the holes, I found that working around the blanket by doing a single crochet into the hole followed by a chain-1 worked great. the edge stayed nice and flat! As I was working around the blanket, I was folding the edge of the blanket to the back. Remember, how I made the holes 5/8" from the edge? That was so I could fold it back as I go. I think it gives it a very finished look. The only other thing to remember is that when you come to the corners, make sure you add additional stitches - otherwise the blanket will curl. I did three single crochets into the holes going around my rounded corners. Depending on your gauge and if the corners of your blanket are rounded, you may need more or less extra stitches at the corners. Once you finish your base round, you can do whatever you like! I picked a crochet edging from Edie Eckman's Around the Corner Crochet Borders book for the blanket below. Because the pattern repeat was pretty small for this particular one, I didn't worry too much about my stitch count. I just "fudged"it a little at the corners to make it work. I don't think baby will mind. I think it would also be very cool, once you did your round of single crochets, to cast on stitches and knit an attached lace edging. I will definitely be experimenting with that when the time comes to make more baby gifts! And that's it! Such a quick, easy and fun gift to give! Note: This post contains affiliate links. See my full disclosure policy here.